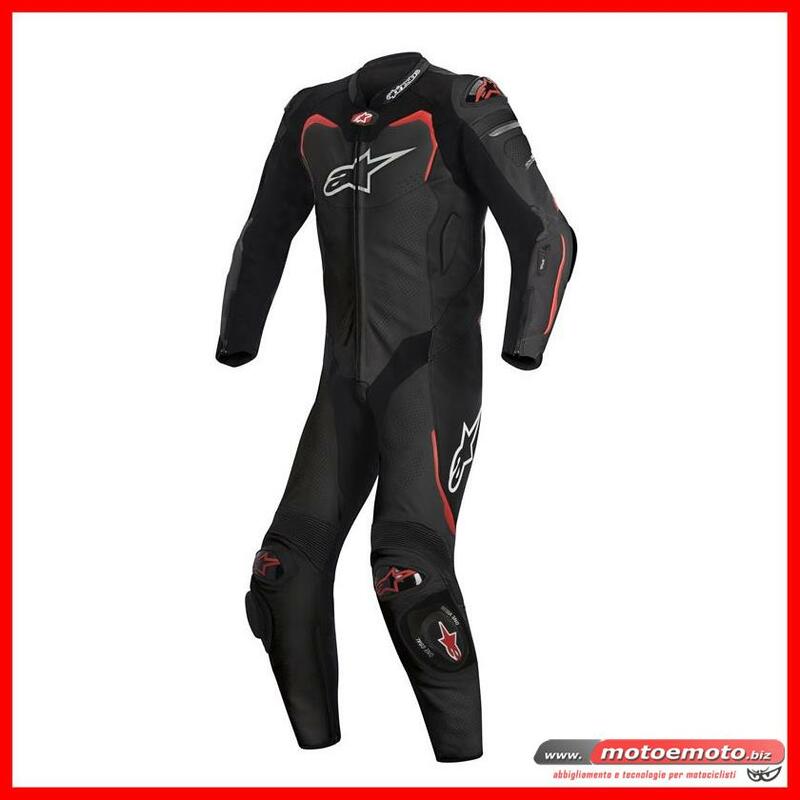 A premium full grain leather suit fully optimized for Alpinestars’ innovative Tech-Air™ Race airbag system. The GP Pro Leather Suit for Tech-Air Race® features an anatomical engineered design to ensure excellent comfort and performance fit for track days or serious road riding. Packed with classleading, track-tested protection inside and out, this ventilated leather suit is versatile and extremely comfortable. Its unique design means it can be equally effectively worn with or without the Tech-Air™ airbag system. CONSTRUCTION Highly abrasion resistant construction using premium, 1.3mm full-grain leather for excellent comfort, fit and durability. 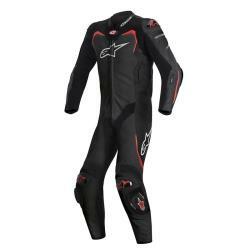 PROTECTION Alpinestars race-derived, external Dynamic Friction Shield (DFS) protectors in the knees, elbows and shoulders feature injection-molded shells and dual density foam padding. Removable, internal CE-certified protectors offer superior impact protection to shoulders, elbows and knees. Snap connection system allows integration of CE level 2-certified Nucleon KR-R Back Protector for the ultimate protection. Chest and hip pad compartments with PE padding (Alpinestars’ Nucleon chest and hip protection available as upgrade). Replaceable Alpinestars PU knee sliders incorporate Velcro® for customized and secure fitment and are developed for the ultimate in feel and sensitivity on the track. PERFORMANCE FIT New performance engineered fit design optimized for use with Tech-Air Race Vest and back protector. Upper body incorporates accordion leather stretch and DUPONT™ Kevlar®-reinforced inserts to accommodate Tech-Air. Race® system’s increased volume in the event of a system-triggering incident. Advanced poly-textile accordion stretch inserts in key articulation areas on the back and extensive advanced poly-fabric stretch panels on crotch, underarms, calf and knees for excellent range of movement. Integrated PE comfort padding on the chest, torso, coccyx and back further enhances fit and comfort while riding. Perforations on chest, arm and leg offer airflow and help regulate body temperature. Airprene collar and cuff for high levels of comfort and breathability. Moto GP-profiled, perforated, back hump for improved aerodynamic and ventilation performance. Alpinestars-developed accordion leather back panel and knee inserts for comfort in riding position. Multi-panel lining incorporates 3D mesh and stretch inserts. Zippered rear calf expansion gusset improves range of fit comfort and Premium YKK fasteners and semi-auto locking zips used throughout garment. Rear reflective detailing for improved rider visibility and internal water-resistant wallet pocket. Internal conduits for quick and convenient connection of suit to airbag system. Left sleeve features LED panel which clearly displays airbag system’s functioning status. Available in sizes: 46-60 / 46-64 (black and red).